Winemaker’s Notes: Veiled in dark ruby red, the wine bursts with a tempting perfume of red and black fruits, dried rose petals, and a peppery note which offers some lift. Dense and ripe upon first pass, it evolves into a savory compote of raspberry, kirsch, and bitter cherry balanced out with mineral and herbal notes. The finish is substantial with tangy acidity, yet buffered with polished tannins that please the palate. My Review: Another day, another Locations wine, another amazing value. Some times this little hobby of mine isn’t all that bad. 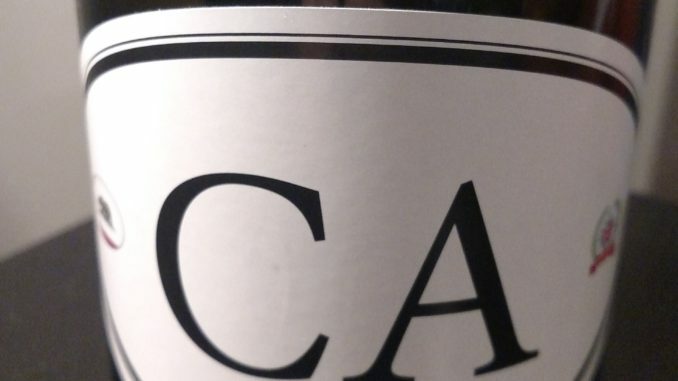 A blend of Petite Sirah, Barbera, Tempranillo, Syrah, and Grenache, with the Grenache really standing out to me, the CA4 from Locations Wine shows aromas of black fruit, dried rose petals, and pepper. In the mouth I picked up on kirsch and herbal notes. The tangy acidity towards the end mellowed as the wine opened up, and while the wine drinks a little hot at 15.5% alcohol/volume, it doesn’t drink as hot as you would think would those levels, and letting it open up does a lot to counter that. My wife actually really loved this wine (I preferred the WA4 over this), and pairing it with some grilled steak salads with a great choice, the red meat complimenting the flavors of the wine, while the body of the wine being a perfect pairing with the meat and greens. Blended California wines under $20 can be something of a risk – I often find them to be too fruity and produced for quantity as much as quality. The CA4 definitely bucks that trend, in part because of its non-traditional mix of grapes. It’s a quality wine at a great price, and one that you should definitely give consideration to if you come across it on the shelf.